Cranberries are one of the few fruits that are native to North America. The 5 states that grow the majority of cranberries in the United States are Massachusetts, Wisconsin, New Jersey, Oregon, and Washington. Cranberries often get a bad reputation because it assumed they have a high sugar content. They are actually naturally low in sugar, however due to their bitter taste sugar is usually added in the processing of cranberry products. Cranberries are typically in season from October until December in the seacoast area. Fresh cranberries are composed of 90% water. In 100 grams there are only 46 calories and 12.2 grams of carbohydrates with 4 of those grams coming from sugar and the another 4 grams coming from fiber. Cranberries are also rich in the micronutrients vitamin C, manganese, vitamin E, vitamin K and copper. The skin of cranberries contain a high level of antioxidants, including vitamin E, vitamin C, quercetin, and, myricetin. These antioxidants can help prevent urinary tract infections. However, these antioxidants can be lost in the processing of cranberry products, such as cranberry juice, dried cranberries or cranberry sauce. So, you’re best bet is to buy fresh cranberries to reap these benefits. Cranberries have also been shown to prevent stomach ulcers and gastric cancer, as well as lower cholesterol levels and blood pressure. Cranberry sauce is a staple in any Thanksgiving meal, but there is often tons leftover. Eating cranberry sauce on its own can become boring quickly. Cranberry sauce can also be used as a jam for toast, heated up to act as a fruit sauce for pancakes or simply used as a side dish for dinner. 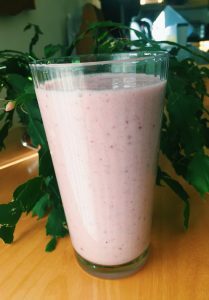 Below is a fun winter-time smoothie recipe using cranberries and apples, which are both still available locally. 1. Place all ingredients into a blender or food process. Blend until smooth.